FORWARD OPERATING BASE ZEEBRUGGE, Afghanistan — Ladies and gentlemen, we’ve reached the edge of the empire. Photographer James Lee and I arrived Tuesday on a convoy on this fire base. 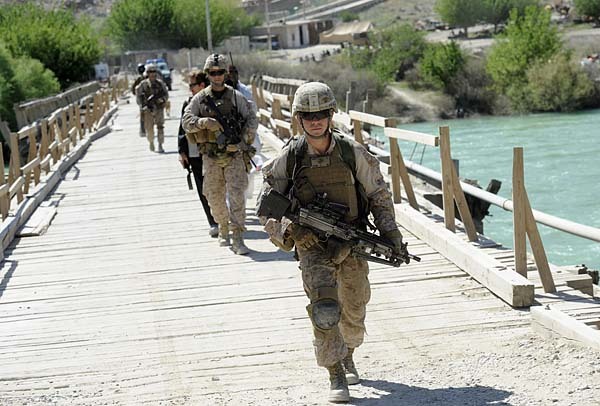 It’s situated on the northern reaches of the Marine area of operations in Helmand province. Only a small Marine observation post known as The Shrine is farther north, and it’s just a short drive away. Zamindawar, a violent section of Kajaki district, is about a mile to the north. We hit the ground running and quickly joined a patrol run by Police Advisory Team 1, 1st Battalion, 8th Marines, out of Camp Lejeune, N.C. Commanded by 1st Lt. Brandon Remington, the unit works from Zeebrugge to train Afghan Uniform Police, who are expected to eventually become the primary force providing security in Afghanistan’s neighborhoods. Remington and his Marines visited the local AUP precinct and escorted personnel with USAID along the way to see where development projects might be possible. They also found an unexploded legacy RPG shell in part of the bazaar, and we waited for explosive ordnance disposal Marines to arrive and safely detonate it. The patrol was an eerie experience without intimate knowledge of the area. PAT-1 was professional and disciplined, but the surrounding environment in the Tangye bazaar was surreal. Some of the buildings stand in ruins, the result of fighting that began in the 1980s between the Russians and the mujahedeen. Within the last decade, the Taliban forced shop owners to leave after British forces took over Zeebrugge after Sept. 11 and sparked intense fighting between the two sides. Marine artillery batteries have manned Zeebrugge for the last few years. They have protected the nearby Kajaki dam and its hydroelectric power plant while also providing artillery for Marines in northern Helmand. The job currently falls to Golf Battery, 2nd Battalion, 11th Marines, out of Camp Pendleton, Calif., but there also is a small contingent of infantrymen with 1st Battalion, 8th Marines, patrolling from Zeebrugge. The Marines living here find themselves in something straight out of an Indiana Jones movie. The surrounding area is farmland, but the base itself has modern buildings that were once used as part of an Afghan resort established before the Russians invaded. Local folklore says that Russian forces took it over and turned it into a recreation facility — complete with a nearby runway — for soldiers. Local people say the mujahedeen eventually overran the base and killed many Russian soldiers in the process. I’ll work to see what I can confirm on that front, but there are certainly signs that the folklore could be true. Much of the bazaar sprung up along an arrow-straight section of pavement resembling an airstrip. Jet engine and automobile parts lie nearby in a few places. Marines who have spent time on a few observation posts in the area say that tanks, personnel carriers and other military equipment also were left behind after the Russians pulled out of Afghanistan. It’ll be interesting to see some of the Russian influences here in the next few days. I served with the British Army at FOB Zeebrugge in summer 2009, 2nd Battalion the Rifles. After speaking to a few locals, including the local District Commissioner I can confirm that Zeebrugge was occupied by the Soviets as an R+R camp. Hence the remains of the swimming pool. Previous to this it was a muslim charity aid location and before this a hunting lodge for the Afghan King. I actually spoke to an old guy who had been the King’s gardener in the late 60s. He told me he had planted many of the trees in the camp. He chastised us for not watering them as most were dead. Zebrugge was initially a R+R location for the soviets. However things changed and the Afghan mujahdeen later overran it and slaughtered most of the Soviet troops. They made their last stand in a building called the Militia House, which is still standing and is located just outside what we called the back gate on the Western side of the FOB. Bullets strike marks were still visible. We also found some tunnels in the hill side adjacent to the FOB. As far as I am aware the FOB was named after a battle that the British Royal Marines were involved in 1918. I remember very well the high ground/hill called Shrine, if you went north of it you got contacted by enemy in a big way. Fun days.